Sir Paul McCartney has turned back the clock almost half a century to return to the venue where the Beatles performed their last concert - as he was reunited with his younger self. 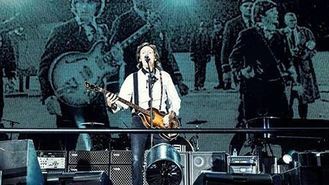 The 72-year-old musician performed at San Francisco's Candlestick Park while fans saw a previously unseen image of the Fab Four, from their 1966 gig at the stadium, beamed on to a screen behind him. The picture, which shows the band walking across the pitch flanked by police to ensure their safety, was screened as Sir Paul performed Little Richard's Long Tall Sally, which was the final song the band performed in its entirety at their final show. His concert last night (August 15) - in front of 50,000 fans - was part of his Out There Tour and marked the last concert at the venue. The image shown on screen was taken by the late Jim Marshall, who was the only photographer given unlimited access to the concert on August 29 1966. Lily Allen revealed a little more than she intended when she suffered a wardrobe malfunction at V Festival. Rock band Manic Street Preachers have been forced to cancel their performance at V Festival after being stranded in Hungary. Blink-182 have said their eagerly anticipated upcoming album is going to be "the one". Lily Allen is to headline the concert at this year's Edinburgh Hogmanay celebrations. The Courteeners' Liam Fray has admitted he's worried his band will be "left in the wings" when they go up against Britain's Got Talent act Collabro in the charts. One Direction's Liam Payne has revealed he is suffering from homesickness on tour. Professor Green has said he dropped James Arthur from his album because the singer "kind of imploded". Sir Paul McCartney is set to play a concert at a famous San Francisco landmark before it is demolished. Taylor Swift is set to perform at the MTV Video Music Awards.